From our showroom in The Netherlands, PTTM muscle cars offer : Real-deal 1967 Pontiac GTO 4 speed in the awesome triple black color combination and completely concours restored. The car is recently restored in our shop and everything you see is either rebuild, new or restored and the car is equipped with its numbers matching engine still in place. The body is super solid and the paint is amazing with a hand polish piano style finish. This combined with the black vinyl top and black interior makes is look amazing. The car is equipped with Factory original power steering, Front power disc brakes, manual 4 speed trans with console and black bucket seats, the rally dash and great looking black dog dish wheels with red line tires. With the 67 GTO being one of the most desirable model years ever and in this combination and color this car is HOT. 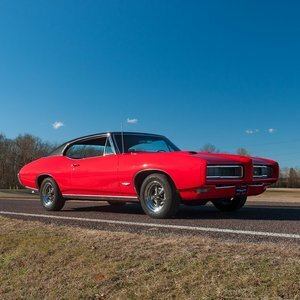 The underside of the car is also ultra clean and detailed, and the complete drive train, suspension, steering and brake components are rebuild and this true GTO drives amazing and like new. Its a car that gets many Thumbs up every were you take it. How often do you see an unspoiled, original GTO and painted Triple black, numbers match ? For this money this car is a great investment and fun to own and enjoy. Just an amazing car that's completely ready to be driven and enjoyed and original !, it just doesn't get much better than this. For this price you wont find a better, more nice or original car in this concours condition. It cant be compared with just any GTO. And if you want the best looking quality car around, THIS is it. FOR MORE INFO, ADDITIONAL PICS, AND VIDEOS! PLEASE VISIT OUR WEBSITE! Car is in our showroom and comes with US title and EU import taxes all paid !. Its fully serviced and inspected and has NO flaws and it runs amazing. For more information, videos and pics or anything else about this or our other cars please visit our website !. 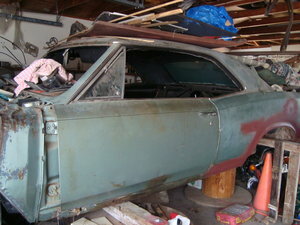 PTTM is a high-quality Musclecar speed shop with 40+ high-quality Musclecars & projects for sale. We are all-round and have restored & built many award-winning cars. We have our own engine and transmission build department and body and paint shop, as well as a large parts store. And we are only around 1,5 hour drive from the hook of Holland ferry !